So many people love my Bhaji Bites, but have asked for a sweet version, so here it is. 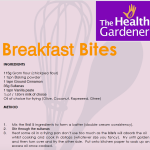 Perfect for breakfast, for a picnic, after dinner or as an after school snack for the kids. Why not let the kids have a go at cooking them as well. Because they’re made from gram flour (chickpea flour) it’s high in protein so will keep everyone feeling full up until lunchtime. They’re great served with a splash of coconut milk (from a tin) and some stewed apple or berries.